The second technique is to concentrate the grapes allowing them to freeze, as in the case of ice wine (in German, Eiswein). These concentrated wines have more sugar (in extreme cases, several hundred grams per liter), more acid (to give balance to all the sugar), more flavors and more complexity. The resulting wines are among the most age-worthy of all wines. 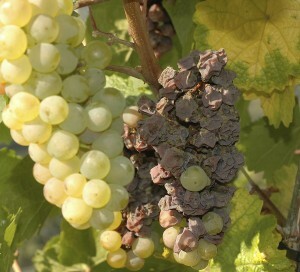 The beneficial use of “noble rot” was discovered in the late 18th century at Schloss Johannisberg in the Benedictine Abbey of Fulda. At the abbey, they once started picking rather later than had been their custom and the grapes had begun to rot. It turned out that the wine made from these grapes was of exceptional quality and greatly exceeded expectations. The first Eiswein is rumored to have been made in 1794 in Franken.